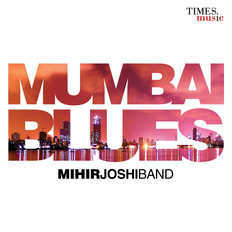 Mihir Joshi Band | OK Listen! Mihir Joshi has been a known name in the Indian music scene for a decade now. He did radio for 8 years, all the while supporting Indian bands and singers on his shows. He did a couple of TV shows as an anchor and hosted hundreds of live events as well. He currently hosts his own popular talk show called The MJ Show on youtube (www.themjshow.in) on which he chats with the biggest names in the music industry. But through all of this, his primary passion was always his music. He's been performing with various musicians for nearly as long as he's been doing everything else. However, he felt that he found the perfect fit when he met with the members of the Mihir Joshi Band (MJB). Mihir invited Sanju Aguiar, Virendra Kaith and Ishaan Krishna to form MJB in 2012. Since then they played quite a few gigs and eventually sat together and worked on songs that Mihir had written. The result was "Mumbai Blues". The songs on the album are not all strictly blues songs but the blues is foundation on which most of the songs are based. In any case, like everything from Mumbai, they’re a mix of many ideas and styles and that’s pretty much why the album is called “Mumbai Blues”. It's blues and rock n roll and stories from Mumbai but they talk about things that any Indian anywhere can relate with. The songs are about traffic jams, potholes, guys and girls, relationships, break ups, fun and even one about Sachin Tendulkar! It's an album with 7 uptempo songs and a couple of ballads. The album features the fantastic Shefali Alvares on guest vocals on "Sorry", which was the first single off the album. You can see the video for the same on YouTube and on television. Shashank Singh gave guest classical vocals on "Mumbai Blues (Travelling Home Blues)". And Varun Rao has given backing vocals and harmonies on many songs. Karan Deshmukh has done vocal percussions on "Pothole Blues". Just before launching the album on the 31st of May, Ruell Barretto replaced Ishaan as the new bassist of the band. The album has been produced by famed sound engineer and producer Ashish Manchanda at his studio - Flying Carpet Productions and has been released digitally worldwide by Times Music.